NBC affiliate KFOR reports from Oklahoma where in some areas trees and power lines are down with wind reaching 70 to 80 miles per hour. Friday's tornado emergency sent a chill through Oklahoma City and its environs, in large part because it came less than two weeks after a powerful twister drove through the same area. The attention given to the weather pummeling America's midsection plays off the devastation left behind on May 20 in Moore, Okla. — and that contributes to the perception that this year's storm season has been far worse than usual. It hasn't been, says Cliff Mass, a weather researcher at the University of Washington. He noted that the season had an unusually quiet start, weather-wise. "We're catching up a little bit," he told NBC News on Friday. "There's no big-picture association with global warming, or anything else. ... It's just that people are very sensitized to this after Moore." The month of May is prime time for storm activity in Texas and Oklahoma, he said. "Then the tornado frequency moves northward as you get into the latter part of the season," Mass said. If there's any consolation for Oklahomans suffering through yet another threat to lives and property, it's the fact that meteorologists have increased their capability to track and anticipate storms over the past decade. "It's just amazing to watch the technology being thrown at it," Mass said. Friday's storm reportedly spawned a "multiple-vortex tornado." What's that? Multiple-vortex tornadoes rank among the most violent and damaging storms. In such a case, the center of the tornado's wind funnel spawns two to seven smaller twisters, or subvortices. These mini-twisters circulate around the edge of the storm cloud at speeds that can range up to 100 mph faster than the winds in the main funnel. The subvortices typically last less than a minute. The storm that flattened Joplin, Mo., in 2011 had multiple vortices, as did a powerful storm that swept over Indiana last year. (This picture of the Indiana storm actually shows the subvortices.) The National Weather Service's Storm Prediction Center says multi-vortex tornadoes are probably behind most reports of multiple tornadoes hitting at once. Purdue University tornado researcher Ernest Agee says one characteristic of a multi-vortex storm is a pattern of asymmetric damage. One side of a structure might look relatively untouched, while the other side could be completely destroyed. "Those individual vortexes are very destructive," he said. Why is Tornado Alley more prone to deadly twisters? The classic explanation has focused on Tornado Alley's geography: The Rocky Mountains tend to impede the eastward flow of moist air, while the Great Plains allow frigid air to stream southward from Canada and meet up with warm, humid air from the Gulf of Mexico. However, the National Weather Service's Storm Prediction Center says this is a "gross oversimplification" when it comes to explaining the origin of tornadoes. Mass cites an array of factors that include strong vertical instability and a large amount of wind shear during the spring. "Everything comes together to make this the spot for tornadoes," he said. The National Weather Service provided this preliminary damage path for the tornado that swept through the region around El Reno, Okla., on Friday. "Tornado Alley" generally refers to the region centered in Texas, Oklahoma, Kansas and points north, where tornadoes are most frequent — but multiple studies indicate that the deadliest twisters occur to the east, in a region that's come to be known as "Dixie Alley." The reasons for that have to do with geography and demographics as well as meteorology in the southeastern United States: Storms tend to move faster , and they're more likely to strike at night. There are more trees and other obstructions to raise havoc. Population densities are generally higher, and the region has many manufactured homes that lack basements in which to take shelter. Are tornadoes a uniquely American phenomenon? "The short answer is, we have no idea," said Michael Wehner, a climate researcher at the Lawrence Berkeley National Laboratory. For years, Wehner has been studying the climate models for extreme weather, and he's a lead author for the next report from the Intergovernmental Panel on Climate Change as well as the federal government's latest national assessment on climate change. When it comes to rainstorms, researchers say there's a clearer link to climate change. "The metric that I like to look at is the daily amount of rain for a storm that happens once every 20 years," he said. "That storm, in a much warmer world, would happen more frequently." For example, if the world follows a "business-as-usual" scenario, he projects that the average temperature would rise 11 degrees Fahrenheit (6 degrees Celsius) by the end of the century, and that a once-in-20-years rainstorm would come around every five to 10 years on average. 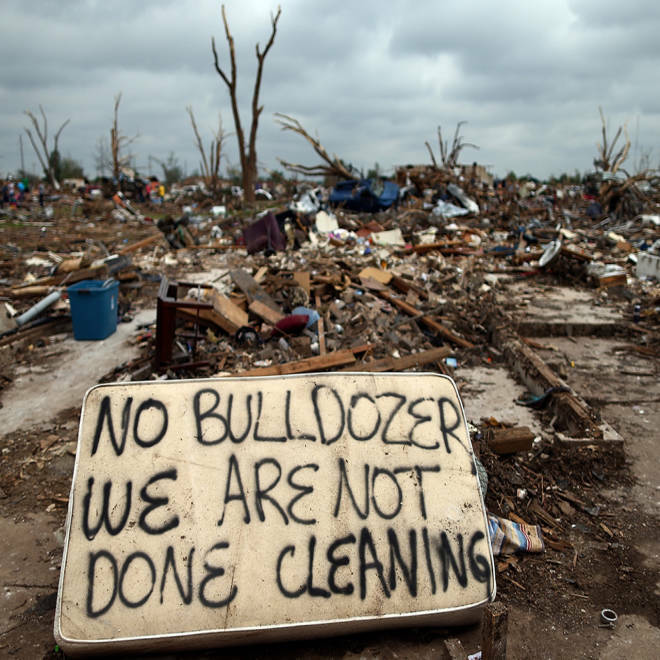 Images document the devastation left behind in Oklahoma after the May 20 tornado. Flash interactive: What causes tornadoes? This report incorporates information from a May 20 posting on the science of tornadoes and a Cosmic Log item about multiple-vortex tornadoes from March 2, 2012. Alan Boyle is NBCNews.com's science editor. Connect with him by "liking" the NBC News Science Facebook page, following @b0yle on Twitter and adding him to your Google+ circles.